This week's recipe is well and truly in keeping with this blog's "traditional British recipes" theme. 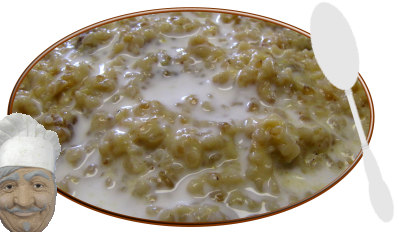 Frumenty (or "Furmity " as it is also known) is a porridge made with wheat that was standard fare for the peasantry from Saxon times until perhaps a century ago. I have made two versions of it for this recipe: a sweet version and a savoury version. The sweet version makes an excellent breakfast or a filling dessert. It was made famous in Thomas Hardy's classic novel, "The Mayor of Casterbridge". The principal character in the novel becomes drunk on the rum which was added to frumenty in days of yore. While drunk he sells his wife, but upon sobering up he regrets his action, forswears drink for 21 years and goes on to become mayor of the town of Casterbridge. It is a good story but we won't dwell on it here. Instead we will make frumenty; here is how I prepared it. What does it taste like? I would describe the sweet version as similar in flavour and texture to oatmeal. The egg yolks add a hint of custard. I didn't have any rum in my kitchen so I made an alcohol free version (my wife is very relieved to hear that) but rum is definitely, by tradition, an essential ingredient. I found dried mulberries at my local bulk food supplier. They taste delicious but they are extravagantly expensive. Substitute whatever small soft fruit your prefer; raisins and sultanas work well in this recipe. The savoury version would have been the entire meal for the Saxon peasantry. Instead of beef stock it might have been prepared using mutton (old sheep), rabbit or whatever other meat was to hand. I made mine as an accompaniment to an excellent vegeterian curry upon which my lady and I dined in the castle this evening. One last note. Each week this blog attracts hundreds more casual visitors than it has subscribers. If you enjoy these recipes please consider subscribing by entering your email address in the convenient box at the top right of the page. Your email will not be used for any purpose other than to send you new recipes from this blog and I will be encouraged to carry on researching interesting new British recipes knowing that my hard work is appreciated. Thank you. Damned furmity .. Henchard's Downfall ! Thanks for the recipe nevertheless !